US, 1960, 97 minutes, Black and white. Salome Jens, George Hamilton, Joan Blondell, Mercedes Mc Cambridge, Henry Jones, Burt Reynolds. Angel Baby is an interesting and-compelling drama. It focuses on the southern states of the U.S., their poverty, their spirit, their religion. It particularly focuses on the tent religion, the revivalists and the healers. There are the sincere preachers as well as those motivated by greed. There is also a picture of self-deception. However, the film is more complex in its presentation of characters and situations. There is good and bad in each. Salome Jens is introduced in this film (as Miss Salome Jens). A stage actress, she has made comparatively few screen and television appearances. George Hamilton was at the beginning of his career, appearing in more serious films than he subsequently did. Mercedes Mc Cambridge gives yet another smouldering performance as a repressed woman (All the King's Men, Lightning Strikes Twice, Johnny Guitar, Giant). Joan Blondell and Henry Jones are very good as the alcoholic couple who support Angel Baby. Burt Reynolds can be seen in one of his earliest roles. Black and white photography is by Haskell Wexler. Direction is by Paul Wendkos - who in the '70s and '80s specialised in telemovies. 1. The impact of the film? Popularity of religious revival themes? 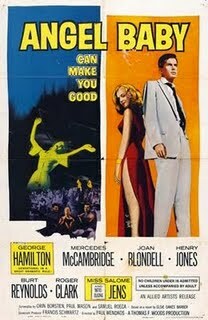 Elmer Gantry, the Aimee Semple Mc Pherson stories? Themes? The '60s and the more frank style of film-making? 2. Black and white photography, authentic atmosphere and locations? The musical score, the songs, the hymns and their lyrics and spirit? Rhythms? 3. The quality of the cast - and assessed in retrospect from their careers? 4. The atmosphere of the southern states, the importance of religion, preaching, the Word of God, healings, miracles? The rallies and the tents? The show on the road? The excitable atmosphere faith, spirituality, songs of praise, Alleluia? The demonstration of biblical themes by re-enactment? The Old Testament? Miracles and healings? Authentic and fake? The stern biblical spirituality and morality? The economic, social and moral background? 5. Jenny as the focus of the film, mute, her place in her family, sexual relationships, with the boys? Her mother and her concern about her? Going to the tent, the atmosphere of the meeting, the attraction towards Paul, the rising atmosphere, enthusiasm, prayer, expressions of faith, the command for her to speak and say God's name, the healing? The effect on her? Her moving towards trying to do good? Yet her beauty, sensuality? Her becoming part of the troupe? Acting in the Old Testament dramas: Sodom and Gomorrah, Bathsheba, Delilah? Emphasising sexuality and religion? The help from the various members of the group especially Molly and her husband? The prayer sessions, healing? The background of her past: Hoke and the picnic? the fight with Paul? Sarah and her hostility? The growing love for Paul? Her being ousted by Sarah? On the road with Molly and her husband? The people that they met? Sam and his attraction, the takeover? Her dress, publicity, the tent, the sensationalism? The possibility of healings? The fake healing and its effect on the people, on herself? Her not knowing the truth? Paul and his visit, the possibility of a divorce, marriage? Sarah's arrival at the prayer meeting, her interruption and denunciation? The chaos? Sarah's death? Jenny as mute, wandering away? Meeting the couple, her reputation, their bringing the child for healing, her unwillingness, loss of faith In herself, praying despite everything? The healing? The reconciliation with Paul? The strengths and weaknesses in her character? Good and bad? Her title as Angel Baby summarising the ambiguities in her ministry? 6. Paul as preacher, youthfulness, his gift, the examples of his preaching, healing Jenny? Sincerity, his following? His marriage with Sarah, the age difference, the bond between the two? The effect of Jenny on him, on tour, the fight at the picnic, the clash with Hoke? The Old Testament demonstrations: Sodom and Gomorrah, Delilah? The sensuality and its impact on his life? The clash with Sarah and Jenny being ousted? The decision to break with Sarah? His wanting her to know the truth about the healing? Precipitating the disaster? The chaos, Sarah's death? Following Jenny and seeing the healing? Sarah and her religion, age, love for Paul, support? Her intensity? Formal religion? Her harshness and fire and brimstone quotations? Her own sexuality, offering it as a sacrifice to Paul? Repression, ousting Jenny, her jealousy, the outburst, the denunciation in the tent, the chaos and her death? 7. Molly and Ben and their experience, age, drinking? Good nature? Believing in Jenny? Molly's vision of the aura? Anxious, going with Jenny, the drunk driving, helping, Sam, the-confusion? A portrait of good people caught up in the religion and its background? 8. Sam and his business sense, the sponsoring of Jenny, exploiting her, the dress, hiring the cripple? The confrontation with Paul? Chaos? 9. Hoke and the boys, relationship with Jenny, the picnic, the fight, the visit to the healing ceremonies, talking with the girls? 10. The range of people in the South, the hard life, religious tradition, expressive of faith, belief in healings? Intensity, fanaticism, sincerity? The exploitation of frenzy? Authentic healing? 11. The religion of the tent preachers, prayer, hymns, healing? The influence of this kind of religion on American society? The film is a courageous attempt to portray two characters with mentally disturbed psyches in a sympathetic manner. It raises the questions of their compatibility, their ability to live together, to form a household. It then takes up the important issue of pregnancy and the capabilities of the two to act as mother and father. This is especially strong as the man decides that they should go off medication. While he secured a job, he finally cannot stay at it and his wife collapses without her medication. They also try to do without an obstetrician, relying on a midwife. When this is too much for the woman, they have to take her to the hospital where she dies but the baby survives. The portrayal of mental disturbance is interesting as it places the man and the woman in the context of a help group and a sympathetic doctor. The film also shows aspects of esoteric madness as the young woman gets all her messages from Ariel, the angel in Heaven, via the letters and answers of the popular television show, The Price is Right. Colin Friels and Deborra- Lee Furness portray the brother and sister-in-law of the man, Colin Friels as sympathetic but not always understanding, Deborra- Lee Furness as much kinder and allowing them to live their lives. It is quite a moving film. 1. A sympathetic portrait of mental illness, of people, situations, ability and inability to cope? Eliciting understanding and sympathy from the audience? 2. The Melbourne settings, the city itself, buildings and homes, the Westgate Bridge, parking complexes? The contrast with the drop-in centre? The hospital? An authentic feel to this story? 3. The film's awards, the strength of the cast, the writing? 4. The title, the focus on songs concerning angels, "Special Angel", "Angel of the Morning"? Ariel and her presence to Kate, sending messages, The Price is Right and the letters and the questions? The baby conceived as a gift from Ariel? The ending? The live baby? 5. The opening with the group, the individuals and their particular problems, presenting them at the discussion group, seeing them together, on the bus, the centre? The effect of the sessions, Kate being introduced? Harry observing? Their interactions, wanting help and support from Harry and Kate? Helping them with the baby, having to take them to hospital? 6. Harry in himself, his illness, seeming to be able to cope, his medication? The opening, in the city, the rain, going to the centre, glimpsing Kate and attracted? Staying with his brother, his relationship with Maurice and his wife, his room, boarding? The times that he lived by himself? His seeing Kate, pursuing her along the street, in the parking lot? Their talk, her desperate need to see a television? His infatuation, falling in love? The detailed collage of their relationship? Their joy in one another's company, sexual relationship? The proposal, taking Maurice and his wife aback? The tension at the meal? His interviews for the job, promoting himself, the scenes of him at work, lacking medication, failing at his work, the superior asking him to leave? 7. Kate, her background, seeing herself as mentally fit, her illness, being pursued by Harry, allowing it, their talking, watching the TV, Ariel and the messages? Her interpretations? Moving in with him? Her dressing up for the visit to Maurice and his wife, the dinner, the tensions, the wife making her welcome? The discussions afterwards, the proposal? Maurice and his hesitation, his wife being more understanding? Setting up home, managing, living like husband and wife, the tensions, the lack of medication, Kate and her episodes? Their standing on the bridge and pretending to be birds flying? Her pregnancy, her certainty, no obstetrician, her statements to the doctor? Their having gone to a midwife? 8. Maurice against the pregnancy, his wife visiting and helping, her later discussions with Maurice? 9. Kate's collapse, the discussions with the doctor at the centre, the other doctors? Their decision, Kate and the group helping her for the birth, her illness, going to the hospital, Harry with her, the induced birth, her collapse? 10. The group, their help, the hospital, the birth scene? Harry and the impact of having the child? Kate and her giving life to the world while dying? The baby living?